Window fashions are known by many names and encompass many styles: window treatments, drapes, panels, curtains, café curtains, valances, cornices, roman shades, blinds, shades, roller shades, woven woods, cell shades, shutters, and more. Regardless of your need, Ronica’s Custom Creations can design a stylish solution for your windows. Draperies are the 2nd layer (blinds, shades, and shutters are the first) of window treatments. Custom window fashions differ quite a bit from pre-made treatments. 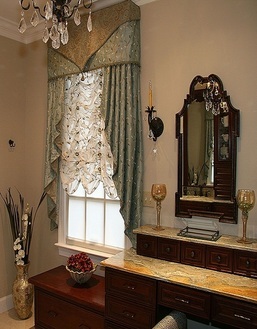 Custom draperies, valances, and other top treatments are typically made with a higher quality of fabrics and linings. There are more styles and fabrics to choose from so you get the perfect fabric to complement your décor. There is much more attention to details such as pattern matching and placement. They have an interlining which adds more insulation and a more luxurious look and feel. They are precisely measured to fit your windows exactly, no matter how unusual your window shape is.